At some point, you need a break from your kids. You need to go out and enjoy a much needed night out relaxing. To do this, you need to find out how to choose the right babysitter, which can cause a lot of anxiety for some parents. It can be a stressful experience letting go and allowing a stranger to take care of your children, but at some point it’s necessary. It’s healthy to spend time apart to lessen the effects of separation anxiety, for both you and your children. However, you don’t want to be miserable while you’re doing it. Before you go out, make sure you spend the time to find the right babysitter for you and your family. The right babysitter will put you at ease and make you feel more comfortable going out. A great tip is to make sure you’re doing something you really enjoy, so you’re not tempted to ruin the night by worrying about your kids. 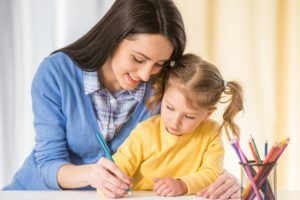 Figuring out how to choose the right babysitter can be an overwhelming process, but if you break it down into a few key steps you’ll find you have a much easier time. Before beginning the process, you should have a system in place for how you’re going to judge the potential babysitters. Conducting an interview and calling references are just two of the many possibilities. Below are a few tips on how to choose the right babysitter by evaluating them so you can find the one right for you, and weed out all the ones that aren’t. The best way to get a feel for someone is by talking to them. You’re hiring them to do a job, so don’t hesitate to schedule an interview at your home or a quiet public place. You should start off by getting to know them a little. Is this their only job? What is their availability? Do they have any experience? As the conversation continues you should start to dig a little deeper. Find out if they smoke. Ask how they feel about having friends in your house? You probably already know if you want your house open to more strangers or not, but by not revealing your opinion on the matter, you’re allowing them to answer more authentically. You should also start to ask harder questions that required detailed answers. Ask about specific instances they’ve encountered while babysitting. Or if they have no prior experience babysitting, other interactions or situations with children could suffice. Have they ever had to deal with an emergency? If so, how did they respond? Ask a lot of questions and have them retell the story step by step as best they can. This will help you evaluate how well they handled the situation, and how truthful they are being. Do they know CPR? If not, are they willing to learn? You want to make sure your babysitter is capable should something go wrong. Another important topic to cover during the interview is their philosophy on child care and discipline. Are they reasonably close to yours? Are they willing to forgo their personal opinion to accommodate yours? You don’t want someone who completely opposes your parenting style, however, you may have a hard time finding someone who agrees completely. This is why you want to make sure they are accommodating and are willing to do things the way you want them to be done. Why are they seeking a job? Why babysitting? Why did they leave their old job? All important questions to ask to determine what their intentions are. How long can they see themselves working for you? You don’t want to go through the whole process of showing them the ropes of your house and allowing your kids to get comfortable with them, for them to up and quit. Interviews don’t have to be super structured if you don’t want them to be, but these are just some suggestions of questions to ask to get right to the information you need to know. References are going to be your best friend when it comes to finding a babysitter. You want to speak to past families who have worked with them. Feel free to ask them specific questions and ask for specific examples, you don’t just want to hear generally if they were a good or bad babysitter. You may even want to ask questions that go beyond just your children, did they ever suspect anything was stolen? Did they ever know of the babysitter inviting other people over without their permission? Why did they stop using them? Even if they have no previous job experience, references are still a great way to learn more about their character and who they are. If they’re going to be spending time alone with your kids, don’t hesitate to do a little digging! Ask them if they’re comfortable with you being at home for the first babysitting session. If they’re a good babysitter, they should say yes. Don’t hover over them, stay out of the room and keep an ear open to what’s happening. How do they interact with your kids? Do your kids like them? What activities do they have your kids do? As you get more comfortable with them, maybe even run to the store for an hour and see how that goes during your time away. A trial run is a great way to find out if the babysitter is a good fit or not. The truth is they could have an outstanding resume and glowing references, but if they don’t interact with your kid well — they aren’t a good fit! This is a great rule of thumb when considering how to choose the right babysitter. Younger kids need far more attention and special care, and the older the babysitter is the easier it will be for them to handle these responsibilities. Plus older sitters usually come with more experience. All of these are great ways to assist you with how to choose the right babysitter for your children!